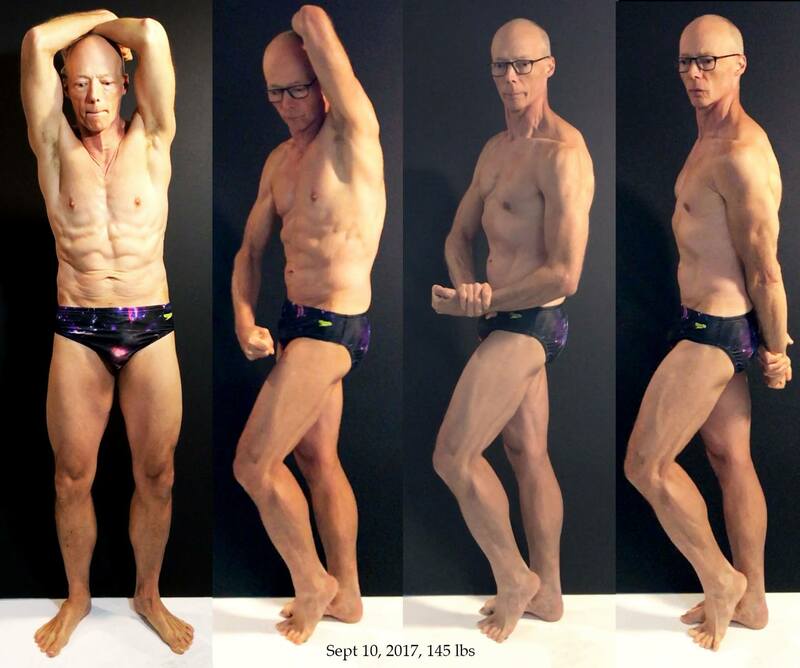 As you can see, he was already a pretty fit guy and maintained a meticulous exercise habit. 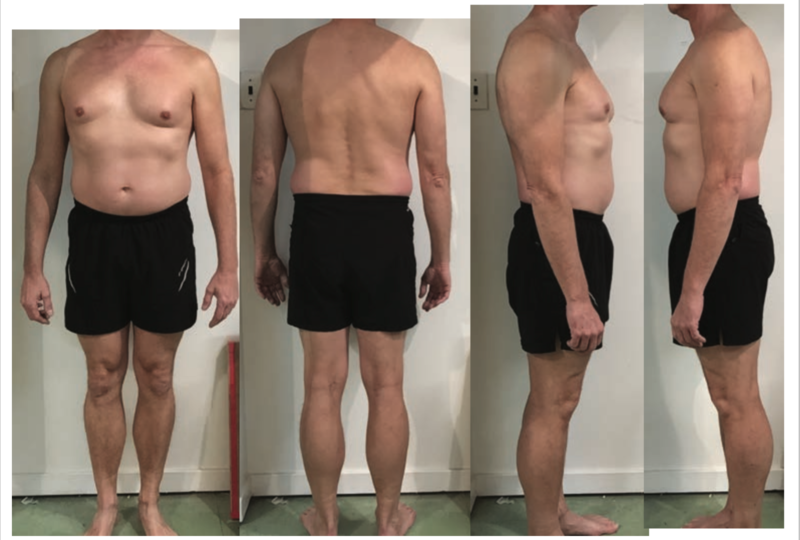 He came to me specifically looking to improve his swimming stroke (look better naked), get stronger (look better naked), and to improve his physique…you know, look better naked. Well, much has changed since our first meeting 18 months ago. So without further ado, let’s look at Brian naked! This is from just a few months ago at his last assessment. 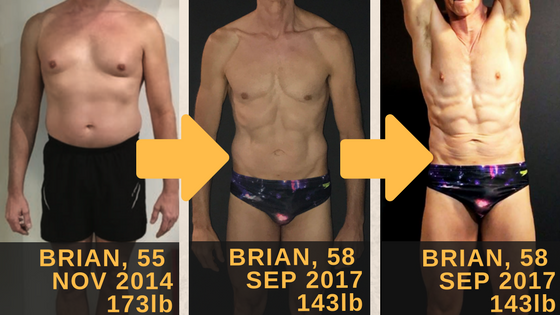 [UPDATE NOV 2017: Brian has been hard at work on his personal and bodybuilding goals. Here’s a recent picture. ND: Okay Brian, why don’t you tell us a little about yourself? BD: While writing something about myself, I noticed a theme. I have made a life of pressing up against my fears and moving through them. I am a 57 year old visual artist. Contrary to the boldness of my art, I have struggled with anxiety and belonging; belonging in my skin, in art school, in any group. I grew up believing I was weak and fundamentally flawed. My self-loathing determined a place for me in the world that was dark and unforgiving. Luckily my aspirations are bigger than the myths. The hardest thing I ever did was walk into a gym, where I most certainly did not belong. For me, gyms were places for athletes – not chain smoking obsessives who lived on sugar and coffee. But my body had slowed and the junk added up to a soft 180 lbs. I had to do something. Luckily my aspirations are bigger than the myths. I changed my lifestyle just to wake up at 5 AM, when the gym would be empty. I hacked together a little routine and went every day. I began to cultivate a new Brian. This persona was of a disciplined fitness enthusiast. After a few short years the deception simply slid into fact. I rarely missed a day, and the workouts became more challenging. I learned to swim when I was 40, started running when I was 48. Somewhere in there I discovered group exercises like Spinning and BodyPump. Unsolicited, a friend suggested if I wanted to get serious about strength training I should talk to Nick. 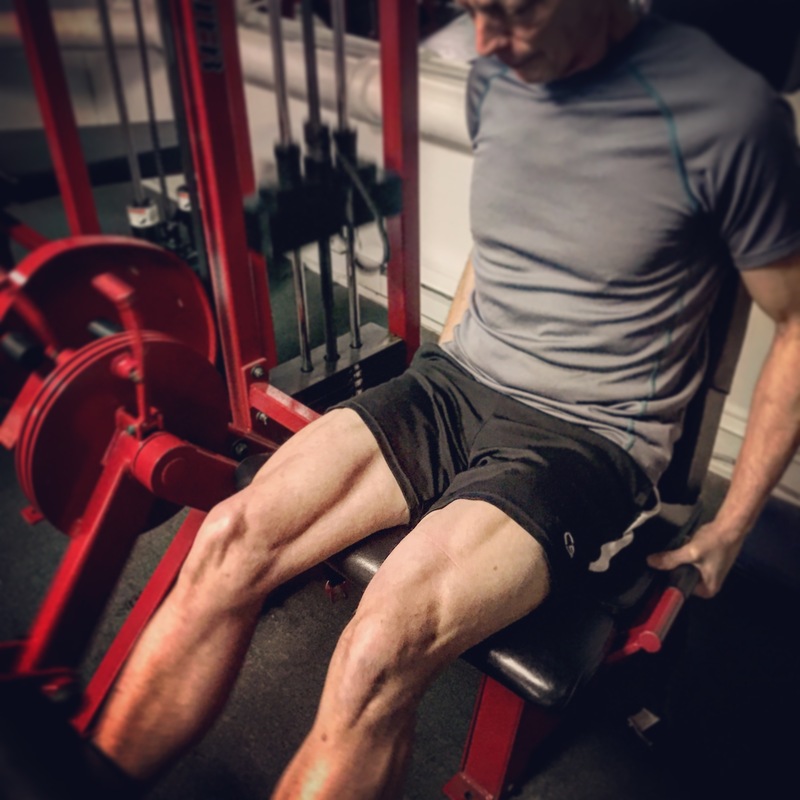 The old me was mortified that he would think I thought that I had any strength to train. But the new Brian was intrigued that he believed I could. It took a while to get the courage up but I started training with Nick 18 months ago. So you made a complete identity shift – powerful!! Looks like it’s just another genuine side of Brian at this point. What would you say has been the best part of your experience working together? For someone on shaky ground, it is helpful to have someone who doesn’t hear the crap in your head and believes. It is inspiring knowing Nick thinks I can. I am starting to see the Brian everyone else sees. I never realized this is a role I play for you – I’m thankful to be able to offer that perspective and now to be able to hear about it. What motivates you to push harder in the gym when your body wants to quit? Wanting to go to the next level helps me to push through. Also, I hate admitting defeat. In what ways do you think you’ve changed since our first meeting? I previously considered free weights and bars for the “big boys.” I am more comfortable in the weight room. I’ve gotten stronger and lost 30 pounds. And though I want to go so much further, I like how I look now. I think I just told everyone, ha! What’s your favorite exercise in the gym? What’s your favorite thing to do outside the gym? You’ve also been undergoing a parallel nutrition program with me, tell us about it. How has it contributed to your progress? Changing my nutrition has significantly brought my weight down. I’ve always been disciplined with working out, but my nutrition was very limited. You helped me understand what I needed from food and then find foods I would eat. You know, I didn’t realize people could be such picky eaters, so it’s great to have a team effort 🙂 What do you wish more people knew about training with a coach? Don’t be intimidated! Working with a trainer opened up so many more exercises for me. Having a trainer teacher proper form and then remind you until it is ingrained is very valuable. It has allowed me to train smarter, get more results and spend less time at the gym. What advice would you give other people who are considering hiring professional help as you were 18 months ago? If you are thinking about it just try it. You don’t need to commit to anything long term. Look for someone you are comfortable with, but will also inspire and challenge you. You began a few new activities in your 40’s, what advice would you give older beginners? Be patient! Don’t be discouraged by what may seem like slow progress. Change and developing new skills takes time for everyone. The older you are when you start, the more ingrained habits you have to work against. But, if you can find a coach for your activity, use them. At least for starters or for when you want to advance. Lastly, don’t be bogged down regretting you started so “late”. You started! Looking ahead… it’s June 2017. What’s your life like, what are your workouts like, what’s your body like, and what new accomplishments are you most proud of? I hope my life continues as it has in the past few years, making and exhibiting my artwork. I am so excited that the workouts have moved into a body building direction. In a year, I will be larger and stronger. I will be proud that I dug deep, dosed doubt and tried. I will continue to push myself physically but also against any fear that stands in my way. And a big middle finger to Father Time too, right? Haha, great work Brian! !